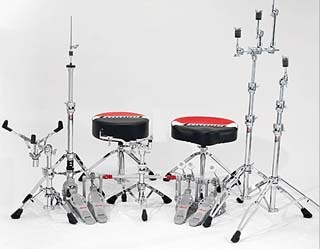 Ludwig Atlas is an completely new family of hardware that enhances the look and sound of your drums. The line consists of three distinct families of hardware, the Standard hardware series, the Classic hardware series and the Pro hardware series. 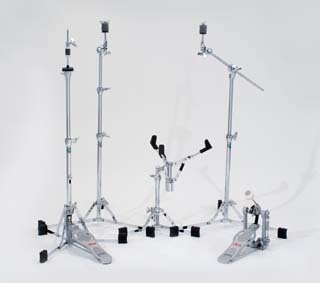 All Atlas hardware uses an "Areodyne tilter" which acts as a gearless dual access rotation positioning system which places and locks cymbals securely at any angle. 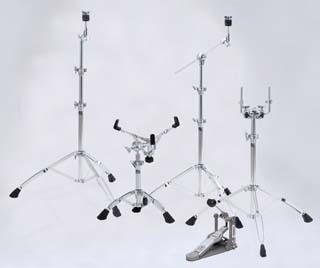 Ludwig's Atlas hardware won "Best in show" at the 2012 NAMM show and is receiving rave reviews from drummers world wide. Atlas hardware is now standard on the Keystone series and can be ordered with most kits shown on this site. The Ludwig Atlas Standard hardware line is a highly function oriented value priced line offering light weight hardware with features for medium to large venues. See Ludwig Atlas Standard hardware details. The Ludwig Atlas Classic hardware line was created for the drummer on the go. It is highly portable and precision engineered for higher functionality and increased durability. They retain the classic Ludwig style with modern improvements. We anticipate this will be the most popular Atlas line. See Ludwig Atlas Classic hardware details. The Ludwig Atlas Pro hardware line is heavy weight durable hardware engineered for performance heavy playing an extensive travel. See Ludwig Atlas Pro hardware details. Please note we do not sell stand alone hardware, you must choose the hardware line at the time of your kit purchase.